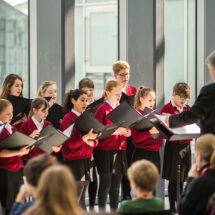 The LMB atrium was filled with music during STEM in Song as the Girls’ Choir of St Catharine’s College performed songs featuring microbes, the scientific pioneer Margaret Cavendish and the chemical formula for DDT. The highlight of the show was the premiere of ‘There in Front of Me’, the winning poem from the STEM in Song competition set to music by the choir’s composer, Gwyneth Herbert. The poem’s author, Isabella Bridge, was present during the event, and read her poem to the audience before the song’s premiere.